Engineering major Larsen and Toubro (L&T) on Monday mounted a hostile takeover bid for Bengaluru-headquartered Mindtree, with a multipronged strategy to buy around a 67 per cent controlling stake in the IT company for about Rs 10,733 crore. 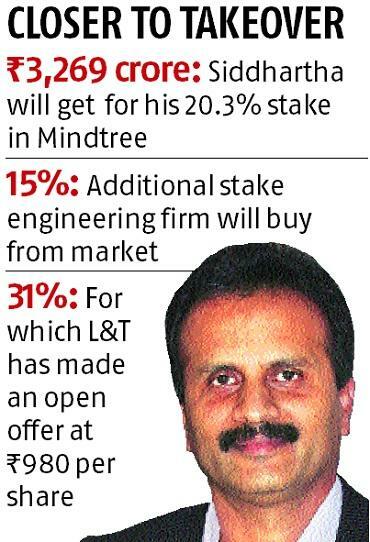 As the first step, L&T entered into a deal to purchase the 20.32 per cent stake of Mindtree’s single-largest investor, V G Siddhartha, at Rs 980 per share in an all-cash transaction, which translates into Rs 3,269 crore. Following the deal, the Mumbai-based engineering major placed an order to buy an additional 15 per cent from the market, also at Rs 980 per share, for a consideration of Rs 2,434 crore. Apart from these two moves, the Mumbai-based engineering major made an open offer to acquire an additional stake of 31 per cent in Mindtree at the same share price, which will cost L&T around Rs 5,030 crore. The price offered to shareholders as part of the open offer and also to the Cafe Coffee Day promoter is just 1.81 per cent higher than the Monday closing price of Rs 962.50 at the BSE. According to the Mumbai-based engineering firm, the deal is likely to be closed by the first quarter of FY20. Commenting on the deal, S N Subrahmanyan, CEO and MD, L&T, said: “This acquisition is part of our strategy to deliver industry leading IT services to our clients worldwide. It will help propel L&T’s technology portfolio into top tier of Indian IT firms.” “This acquisition will allow L&T to further enhance shareholder value for both its own shareholders and Mindtree’s shareholders in the medium to long term,” he added. The engineering major said Mindtree would remain an independent entity, which would be supported by L&T. With this hostile takeover bid, the boardroom battle is certain to be intense. Analysts said the board of directors of Mindtree would have to give a recommendation to the shareholders on whether the offer from L&T was fair and reasonable. Also, the IT firm will have to seek the shareholders’ approval before going ahead with such a plan. With this hostile takeover move, the Mindtree founders are on the backfoot because they have no option but to wait for the outcome of the open offer. “There is hardly much option left for Mindtree’s promoters other than to wait to see the success of the open offer. In case L&T fails to garner a controlling stake, this will give the founders some ammunition to launch a counter attack,” a source said. Sources in the know said L&T had several rounds of discussion with institutional investors of Mindtree, including Nalanda Capital and Microsoft, the IT services firm’s major client that contributes around $200 million to its revenues annually. It has received a certain level of comfort from these stakeholders before taking this huge bet. “L&T is a conservative company and is also accountable to its shareholders. The company has done its maths after taking every pros and cons into consideration,” a person familiar with the strategy said. Currently, the promoters’ group holds 13.32 per cent in the company with N Krishnakumar holding 3.72 per cent and Subroto Bagchi 3.10 per cent. Among other co-founders, N S Parthasarathy has 1.43 per cent while Mindtree’s current chief executive officer, Rostow Ravanan, holds 0.71 per cent in the IT services firm. Foreign portfolio investors (FPIs) are the biggest block in Mindtree with a 40.18 per cent stake. Mutual funds hold 8.34 per cent while retail investors and others 17.75 per cent. 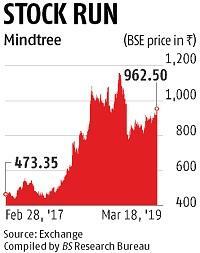 In the last two years, the share price of Mindtree rose 103 per cent and is currently trading at Rs 962.50. Among institutional investors, Pulak Prasad-run Nalanda Capital holds 10.61 per cent in Mindtree while Akash Prakash-led Amansa Holdings owns 2.77 per cent. Singapore-based Arohi Asset Management Pte Ltd, which manages Ontario Teachers’ Pension Plan Board’s stake of 1.22 per cent, is another major foreign institutional investor in the company. Some legal experts say the takeover attempt is likely to face litigation. “A writ petition can be filed in court on grounds of potential conflict of interest by any promoter or a shareholder. Though the case will not be sustained in the long run, it can delay the integration process,” a source said.